YouTube has given its Silver and Gold Creator Awards a bit of a makeover. 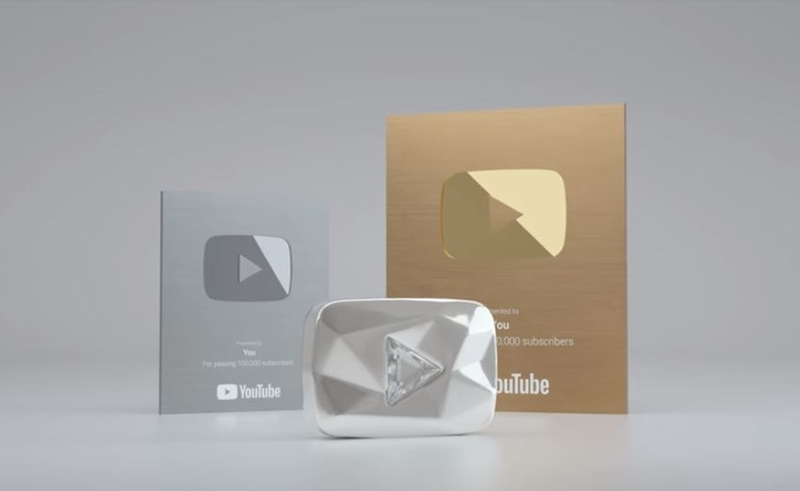 The celebratory plaques for creators who have surpassed 100,000 and 1 million subscribers, respectively, were formerly composed of a medal model of the YouTube ‘play’ button logo housed in a picture frame (see below). Now, the the frames have been done away with in favor of rectangular silver and gold-colored plaques with the play button — and the names of winning channels — embossed. The former Silver and Gold Creator Awards. While the former Silver Creator Award was primarily made of nickel and the old Gold Creator Award was made of gold-plated brass, according to tech review channel JerryRigsEverything, the new awards are reportedly made of higher quality materials. The Diamond Creator Award, for creators who have surpassed 10 million subscribers, remains unchanged. (From the outset, it was a frameless play button with a multi-faceted design and crystal center). The company announced the new look on Twitter, and also via a compilation video that sees a handful of creators — including Lamarr Wilson and Shonduras — celebrating the honor. The new awards will be available to creators who apply after March 29 — though YouTube reiterated earlier this year that it distributes the plaques at its own discretion.